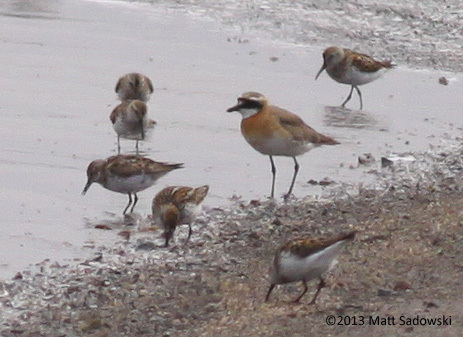 On July 19, Matt Sadowski discovered a Lesser Sand-Plover (Code 3) at the South San Diego Bay Unit of the San Diego Bay National Wildlife Refuge (NWR) in Imperial Beach, CA. A day earlier, he found an adult Sharp-tailed Sandpiper (Code 3), which was seen again on the 19th, at the same location. 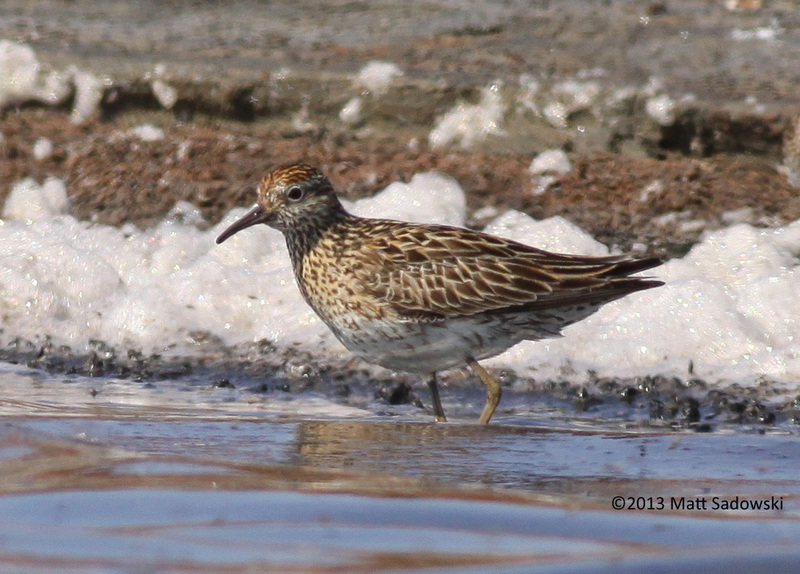 While these birds have the same ABA Checklist Code, the plover is generally much more difficult to see, as Sharp-tailed Sandpipers are regularly found during fall migration in parts of Alaska and the West Coast. However, usually only immatures are seen, so when you take into account its age, this Sharp-tailed is about equally as rare as the plover. Both birds are in a restricted area (threatened Snowy Plovers and endangered Least Terns are nesting here) but were visible from an accessible bike path on the 19th (map here). The Sharp-tailed Sandpiper, along with a locally-rare Stilt Sandpiper, was visible in the area to the northeast of the north end of 13th Street. The Lesser Sand-Plover was initially located in an area not visible from the bike path but was then refound in the afternoon to the west of the north end of 7th Street by Lea Squires. 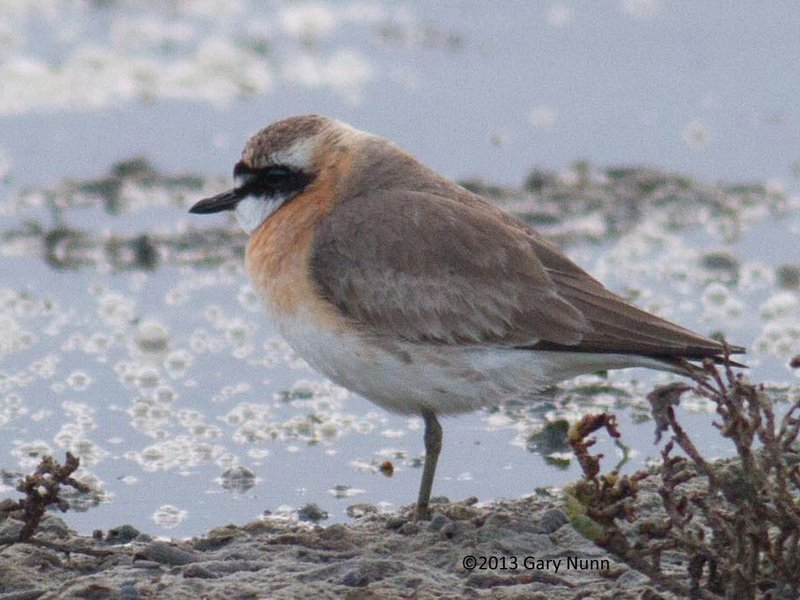 Paul Lehman reports that the plover flew far off to the northwest at 7:50 PM and the Sharp-tailed was not seen in the early evening. Both viewing locations are accessible from Palm Avenue in Imperial Beach. Take I-5 to the Palm Avenue/Hwy 75 exit and go west. Turn right either on 13th Street or 7th Street. Parking is available on the streets. Keep in mind that the shorebirds here move around a lot in response to tides. If they are not around when you arrive, it sometimes pays to wait. Check SD Birds and the ABA Rare Bird Alert group on Facebook [you must be logged onto Facebook for this link to work] to see if either bird is refound on the 20th. John Puschock reports ABA rare bird alerts and manages #ABArare for the American Birding Association. John is a frequent participant in rare bird forums around the web and has knack for gathering details necessary to relocate birds. He has been a birder since 1984 and now leads tours for Bird Treks, as well as for his own company Zugunruhe Birding Tours. He has led tours to locations across North America, from Newfoundland to New Mexico and from Costa Rica to Alaska. He specializes in leading tours to Adak in the Aleutian Islands.